Sakura Mamiya and Rinne Rokudo are an interesting pair: Sakura has been able to see spirits since she was a child, and Rinne is a half-human and half-Shinigami-kind-of-thing whose job is to lead spirits to the Wheel of Reincarnation. They’re getting used to daily life with meddling spirits and love struck Shinigami girls, but with a black cat competition, intense new love rivals, and scheming damashigami hiding just around the corner, can Rinne even handle it all with his limited budget?! Episode 12: Ghost Rubber Boat/ There's Something in the Tunnel/ Welcome to Nehanya! A beautiful transfer student is possessed by a spirit and it's luring boys' souls from their bodies! She claims she's cursed, but does she have an ulterior motive? Episode 23: Sakura the Shinigami?! 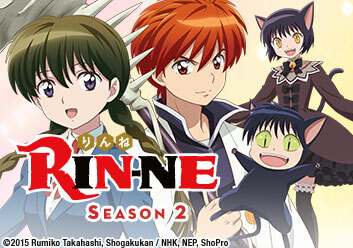 Matsugo, Rinne's enemy-turned-admirer, invites Rinne to a Shinigami school event. To escape this "date", Sakura agrees to pretend to be Rinne's girlfriend.